This article is about the Halo Wars Skirmish map. For other uses, see Blood Gulch (disambiguation). Blood Gulch is based on the Halo: Combat Evolved multiplayer map, Blood Gulch. Like its namesake, Blood Gulch is set in a vast canyon containing two bases; with the far more functional UNSC firebase or Covenant citadel replacing the hollowed-out structures from the original. Between the opposing bases lies a huge, open field with hills, cliffs, and ditches, and rock walls all around. There is some vegetation, but the terrain is mostly desert-like. This map has teleporters, as did the original version from Halo: Combat Evolved and Coagulation in Halo 2. Each side of the map features a Forerunner secondary reactor and a Forerunner supply elevator, both of which are defended by rebel troops and deployable lookout towers. It is recommended to capture new base locations and bonus buildings. The player can use the teleporters to reach the reactors quickly. Since both structures are defended by rebel snipers units, the player should attack with anti-infantry or vehicle units. Taking the rebel base closer to the opponent's starting base can serve as both a surprise attack and a means to slow down the opponent's expansion. Leave a small army and setting up turrets after setting up a base there before moving on to other regions of the map. Blood Gulch was one of the first Skirmish maps revealed to public. Editors from Official Xbox Magazine visited Ensemble Studios, and were able to play on the map. 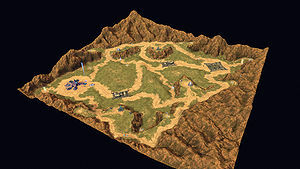 As indicated by the soundtrack played in the beginning of matches set in this map, Blood Gulch is likely set on Etran Harborage, and thus it is the only Etran Harborage map featuring rebels as a neutral faction. UNSC and Covenant forces battle around a Forerunner supply elevator.